First Photo of Mercury From Orbit Comes Tuesday: What Will We See? 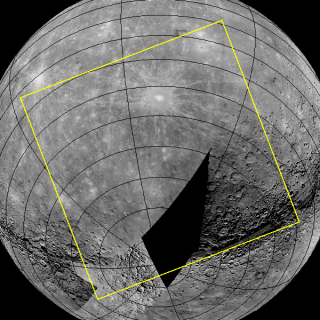 The first photo NASA's Messenger probe takes from orbit around Mercury will reveal an area of the planet (shown by yellow box) that includes never-before-imaged terrain (black area). March 30 UPDATE: The first new Mercury photos can be seen here, with the first science results now available here. NASA's Messenger spacecraft, the first probe ever to orbit Mercury, will snap its first photo of the planet from orbit tomorrow morning (March 29). Messenger entered orbit around Mercury March 17, becoming the first spacecraft to ever do so. NASA launched the $446 million Messenger mission in August 2004. The spacecraft is expected to continue orbiting Mercury for at least one Earth year. Messenger's extreme orbit brings it within 124 miles (200 kilometers) of Mercury at the closest point and retreats to more than 9,300 miles (15,000 km) away at the farthest, researchers said. The probe is still in a commissioning phase, which allows scientists to check the spacecraft's systems after the orbital insertion maneuvers. As part of this phase, Messenger's Mercury Dual Imaging System (MDIS) will take 1,549 images. NASA plans to have the Messenger spacecraft start by taking 364 images over six hours on Tuesday. Messenger is the first mission ever to orbit around Mercury, though the spacecraft did fly by the planet three times before settling into orbit. The first probe ever to visit Mercury was NASA's Mariner 10 spacecraft, which flew by the planet three times in the mid-1970s.